Your brain has good and bad days. If you have a bad day then you see nothing in chess and feel like a blind duck. How to play chess, if you have a bad day and see nothing? To find the proper chess strategy in your game is sometimes hard. In a serious game of chess have you ever known a plan you want to play, but just can’t figure out how to play it? Or your brain feels so dumb and you see nothing and have no idea at all what to play next. How to play? What do you do when your Brain locks up? It’s worth the extra effort to get it right, because the how will make the difference in the way your plan will be executed in time or your opponent is faster and will run you over at the opposite wing or will just get his pieces out faster or you will lose because you move aimlessly here and there without any idea of what to do next. Some people are never short of ideas. Personally, I have good and bad days. Yet there are definitely ways to to get yourself out of the ditch, when it comes to finding the right moves and getting started. Here are my tips for producing great moves even when your brain is not cooperating. Look first for weak spots in your opponents position. Check every pawn and have a good look at the center squares. Is there a weak square where you could place a knight? Does he have a weak, isolated or backward pawn? Look at every piece and determine the energy level of each piece. Does he have pieces that have limited potential? A knight sitting at the corner of the chess board? A dead or half-dead bishop that is reduced by his own pawn structure sitting at the same color of the bishop? An inactive rook that is placed behind the pawn structure? Every piece has a different energy level that changes throughout the game. It depends where it is placed, actively or passively. For example a rook that is placed far away from the battle field and can not take part in the future action. A misplaced queen at the other wing that can't retreat to aid the king? Check the "flow" of each piece and you will see that some pieces have excellent future squares and others are just sitting somewhere and have reduced energy levels as they are obstructed by own pawns and pieces or might sit at the wrong side of the board where no action takes place. In complicated tactical rich positions you should use X-Ray Vision to see the energy lines of your pieces. Do they point all in one direction? If this is the case then search for a combination that wins material or leads to checkmate. Look at the example below. White moves. All the energy lines of the white pieces are shooting towards the black king. The energy level of all white pieces is very high. Now get your brain into gear and find a winning combination. Find out what you wish to do if you could. Sometimes you see a good move but for some reason the move can't be made because a piece of the opponent defends a vital square. In the following diagram White likes to give checkmate playing 1.Qe6++ but the rook would move in between ...Rf6 protecting the king. How to get rid of the rook? In the course of the game sometimes pieces of the opponent or your own are clustered sitting on one side of the board while most of his pieces are sitting at the other side. This will produce an imbalance. Take action where you have more material accumulated. Attack there where you are stronger and where you have some sort of an advantage either in material, time or space. Blacks Queen and Knights are clustered and operating at reduced energy levels. Black's pieces are not well developed and sitting on bad squares. White has more space in the center. White increases Center Control playing 1.Qd4! followed by 2.Rad1! The rook a1 moves away from the long diagonal at the same time to avoid being attacked by Blacks bishop g7 in the future. Do you have a Point of Attack or a General Plan to use weak Squares? Before you make a move, you need to know what you’re going to do. Are you mentally struggling because you don’t have a clear idea of the plan you’re trying to execute? If getting started is your problem, you might find it easier to think about the “meat” of your plan. Find the "meat" first then plan your moves. 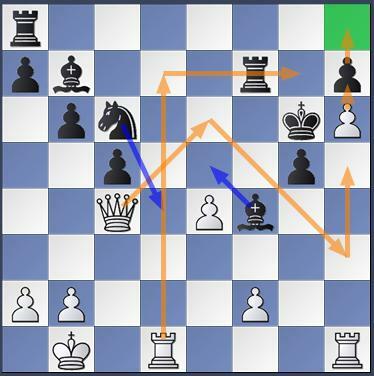 The "meat" can be a weak pawn structure in front of the enemy king that invites an attack or an open file that should be controlled by your rooks or a weak pawn that has to be pressured or an isolated pawn that could be exploited in the endgame. Get the "meat" and the moves will follow. They will follow in your mind. When you have found the "meat" your mind will show you moves that are related to the "meat". Pieces are jumping forth and back in your mind and finally you will organize those moves and see clearly how to proceed. Maybe you just need a break. Walk away, do something else. Rest your brain. Come back refreshed from a zen-like stroll. You got plenty of time in a tournament game that can last longer than 4 hours. Make your Move and walk away for a few minutes. If the opponent thinks fairly long you can use your opponents time for a walk and get some fresh air. You have to make sense of a problem in your own mind in order to understand it. Talk to yourself in your mind. Outline the basics in your head and try to formulate the next steps of your plan and how to go about it. While some genius chess players are grasping chess concepts intuitively within seconds, the rest of us mere mortals have to work within the limitations of our imperfect grey matter. Hopefully these simple tips will help you next time to find the right plan in your game.